I have high blood pressure issues since 2015, I have got my check-up done many many times, nothing came in reports. Doctor said that it was due to stress and there was no health issue. He said, he can prescribe medicines but I denied because I knew that I would get used to it and will have to take it for some time or for rest of my life. Since then I am surviving on Udi only. Yesterday also it was high, I took Udi mixed in water and got well in few minutes. Today also, I felt so. Again took Udi in water and applied. I am fine and much much better. I got chapter 21 of Shri Sai Satcharitra to read that day. At the end of the chapter there was an experience of *The Pandharpur pleader* who when went to Masjid, Baba knew what He had said and discussed in Pandharpur related to Mr.Noolkar. 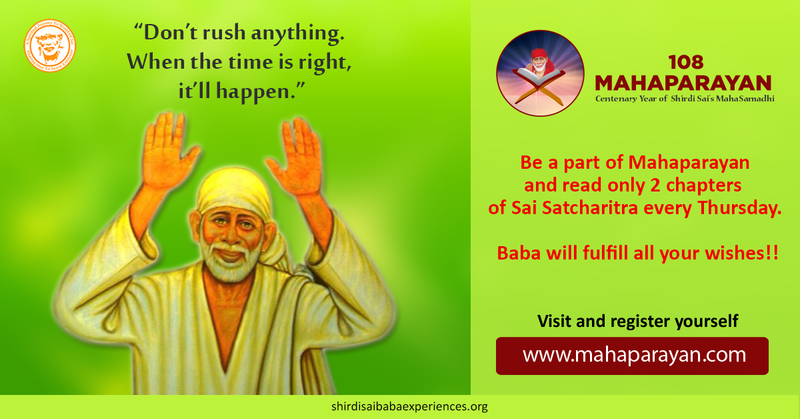 It was said or discussed there whether the ailments, from which the sub-judge suffered were, ever likely to be got rid of without medicines, by merely going after Sai Baba, and whether it was proper for an educated man, like the sub-judge, to have recourse to such methods (chapter 21). On 18th of March the powder that appeared on Baba's lap it was for sure not dust, but it was Udi which is truly a miracle for me. Getting chapter 21 to read that day and then Udi which appeared, I feel Baba is directing me to drink Udi water daily instead of medicines. I am sure Baba will completely cure me with His miraculous Udi and won't be taking medicine in the near future at all. I trust Baba and have immense faith in Him and His Udi. It has helped me a lot, it works wonders. Thanks Baba for choosing us as Your devotees. You alone know how we would have fared without You! Can’t imagine life without You. Life is not easy but when You and Your Udi is there we need not fear life. Thanks once again Deva. Ever Indebted To You Sai...! Love You Sai Maa. Jai Jai Ho Sai!